I received a very unusual submission for moderation for the “Your Rant Here” section of the ChangeInTerms.com site (time stamped at 11:37.m. last night, October 24, 2009). The email address given by the submitter was associated with Chase. The numerous grammatical mistakes (and end of the message) made me wonder if it was from a low level customer service representative. I have little doubt in my mind that many of these individuals are at the mercy of higher-ups at Chase, and as such must do the “dirty work” of enforcing edicts by senior executives (which is what really “jerks my chain” when I note that Gordon Smith was off lecturing on “leadership” while his employees were implementing one of the most abusive acts against customers in the history of the credit card industry). I am just writing to let your users know why we are treating you this way. First understand that times are hard and people are having trouble payi,ng us back what they borrowed. This is a real problem. As a bank we are expected to make a profet for our customers that invest. Secondly, we really have already loaned more money to Americans than we feel comfortable about. The economy in America is just not expected to rise any time soon. The employment rate is bottoming out and this affects our buisness. If people don’t have jobs they cannot pay us back. So the bottom line is we want people to take their buisness elsewhere. Especially those of you that are not using your cards any more. Please just transfer your accounts to another bank and leave me alone. 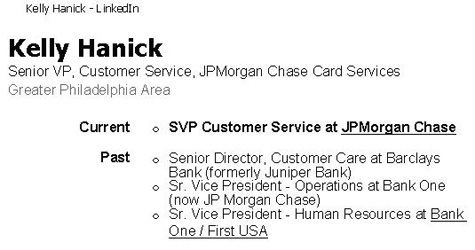 First, there does appear to be a “Kelly Hanick” with Chase. On the ComplaintsBoard.com site under a post entitled “Credit Card Gouging” I found several comments referencing this individual, including some with an email address and telephone number, along with personal (i.e., home) and corporate postal mail addresses. 2) I have never advocated that Chase or any businesses should not make a profit. The problem is, Chase has attempted to do so by employing unethical tactics. Where’s my “proof,” you might ask? 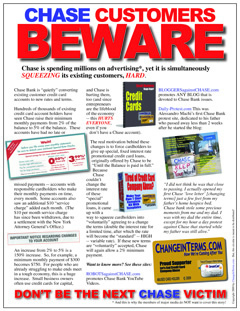 Telling me or customers at large that adding a so-called “service charge” that “is a finance charge” would not impact a promotional APR is a lie (I’m not dancing around with other possible word-choices such as “disingenuous,” “incorrect,” or “misleading” — anyone who knows the first thing about interest and amortization knows that adding a finance charge to an existing APR increases the overall rate). 3) Relative to item 2, above, Chase did rescind the finance charge (in a settlement with the New York Attorney General’s Office). However, it appears to have done so under pressure while admitting no wrongdoing. (And for me, personally, the damage and repercussions were already done — I’ve addressed that further below). Hence, while Chase is worried about being paid, its policies are DECIMATING (in yet another way, besides squeezing consumers to the point of defaulting), the very entrepreneurs who are our only hope for an economic recovery, not just “anytime soon,” but ever. 5) Chase has already made it abundantly clear that its wish is to have people take their business elsewhere. We got that message. Unfortunately, that’s not so easy to do, for some individuals. This is especially true after having their credit scores ruined, lines of credit slashed, and in light of a credit card industry cartel which provides few options (in good times or bad). 6) If Chase is so worried about investors and profits, then it might want to keep in mind that engendering a sentiment of fear, disgust, and loathing among customers is not an effective long-term strategy. Rather, it is a short-sighted, imbecilic tactic, which will become a “textbook case study” in how NOT to treat customers (by the time I’m finished, here). If Chase Wants Peace, it Can Issue a Press Release. Apologize for defaming us (after the first round of change in terms notices), and continuing to disrespect account holders with a PR spin campaign which portrays us negatively before members of the media. Chase still sends change in terms notices to my wife and household (that is a very, very, very, bad idea) — I already told you to “leave us alone,” in no uncertain terms. Accordingly, I personally have no plans to leave Chase alone until the damages to small businesses, customers at large, me, and my wife and family have been undone and rectified (to the extent that this is even possible after all of the pain Chase has caused to its previously identified “most valued cardmembers“). Posted in: Dirty Tricks and Traps, Entrepreneurship, Join the Fight, Testimony. ← I want to take my boy fishing, but I find I’m just wishing. The beast is the entire banking industry. They have been using the consumers for years and we allowed it. I think we need to take control of credit card companies by getting out of debt and shutting our accounts down. Let’s turn a major credit card company into a broke one by switching our accounts to a lesser brand company. That’ll show them. just came back from the bookstore. right when I went in, the table with new releases has a book about dimon, noting how great a businessman he was, and stating he was the most wonderful thing to hit the world. and this was just on the cover! I noticed that such propagandistic flatulence did not allow the reader with an opportunity to leave their own comment. A fluff piece if ever I saw one. bearing on the way we chose to do business!!! its clear to see Obama is in Dimon’s pocket. you will notice, whenever the payrol investigations and regulations come up, chase is never mentioned. Look out everybody – the main stream media is preparing the public for Jamie Dimon to take some sort of public office, such as treasury secretary!!!!! I am really steamed now. I am going to write to whoever I can think of to protest the possibility of such a thing occurring. This bank has ruined the lives of thousands of hard working people….Argh!!!!! CyberCJH, I think that the beast is multi-headed. I keep wondering, for example, why my own CEO of my HMO “made” 1.6 Billion in 2007 and why nobody investigates the deaths. Peggy … Love it. 🙂 I would agree with you, but I don’t think Chase is The Beast. I think the majority of the financial industry is The Beast. Chase is just one of his more evil minions … Chase & BOA. Ha. Heres to you Kelly, you lowlife. We will leave you alone, alright. We will take our business elsewhere. Not only the few million that you have hurt, but the other millions that we influence. Chase is riding high now, but it wont be forever. when foreclosures skyrocket, unemployment surges, and your investments go bad, there wont be consumer you can make money off of. And you can be sure, there wont be another bailout. So live it up now on your big salary, it will come to an end. That I promise you. Yay, Dr. Lahm….I couldn’t have said it better myself. Kelly must be under severe emotional distress to submit such a poorly worded and misspelled missive. Now she knows how we feel! Could Chase be “THE BEAST”?? It is certainly carrying out his work…no man can buy or sell….all we do since the famed “change in terms” is pay everything to “The CHASE Beast”. I’m only kind of kidding…..